Brace yourself – the holidays are coming! It’s already November, and that means it’s almost time to enjoy being around family, feasting on pies, and getting cozy by the fireplace (or at least the couch!). However, it also means that admissions deadlines are approaching for many undergraduate and graduate programs across the country (not to mention fiscal year deadlines for a lot of companies and projects). Fortunately, your friends at Write Track Admissions have three key tips to help you stay productive, creative, and mentally rested during the holiday season as these deadlines fast approach. Instead of waiting for moments to arise when you experience a surge of productivity, schedule time outside of festivities or events so that you can get in a productive mindset. Many who spend their careers working from home use this same trick to stay productive without being at an office setting. By blocking off sections of time on your calendar that you dedicate to working on your applications, you can create your own “office” schedule even from the comforts of your own home or even the local cafe. After all, working on college or graduate applications can be a 9-5 job in and of itself! Don’t try to multitask and catch up on ALL those things you said you were going to do over the holidays. Decide on your priorities, and then dedicate each day or half day to a different task so that your brain is concentrating on one thing at a time. Multitasking seems great, but it’s not necessarily the most efficient way to get certain tasks completed. In fact, it’s technically not even possible! This is especially true when you’re trying to write the best college application, where you should be in a state of ‘flow’, or intense concentration and creativity. To achieve that, deep focus on a single task is much more productive than switching your brain between multiple stimuli. This tip seems counterintuitive, but TED speaker Manoush Zomorodi has made an amazing case for it: your brain NEEDS to be bored sometimes! 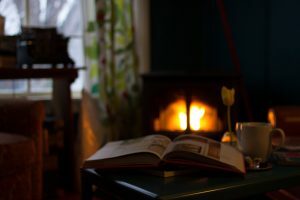 Instead of using the holidays as a time to catch up on six shows you missed while finally sewing that quilt, take time instead to truly relax. I mean, really allow your brain to get bored – that way, your most creative ideas will appear! Once you’re done relaxing, tap into the resources at Write Track Admissions, including our new Write Story service, to craft the most creative, unique application possible for your dream school. We’re here to get our clients across the goal line during the busiest time of the admissions season. The upcoming Thanksgiving break will be a perfect time to rest, reflect, and focus on your creativity to give yourself the best chance of getting into your dream program. Because, frankly, waiting until the Christmas holiday will be too late! Contact Write Track today to Get Noticed and Get In!